How much does it cost to travel to Sukhothai? How much money will you need in Sukhothai? ฿1,721 ($54) is the average daily price for traveling in Sukhothai. The average price of food for one day is ฿555 ($17). The average price of a hotel for a couple is ฿1,359 ($43). Additional pricing is in the table below. These average travel prices have been collected from other travelers to help you plan your own travel budget. If you are the kind of wandering traveler looking to find calm and inner peace, you will want to add Sukhothai to your list. 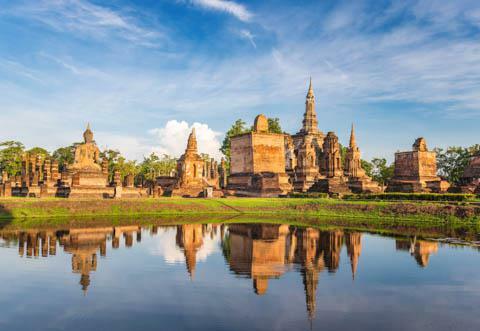 Also known as "the dawn of happiness," this area is best known for the ruins of the ancient city of Sukhothai  the capital of Thailand during the 13th century. As the first capital of Siam, the area's temples and monuments are restored and ready for visitors from around the world. Just a few kilometers west of the current Sukhothai is the Old Sukhothai. As the former capital of the Sukhothai kingdom, this area of ruins is internationally recognized as an UNESCO World Heritage Site. This park is approximately 70 square kilometers, and divided into multiple zones. The central zone is the area with the most ruins and the museum. There are approximately 11 ruins with moats, lakes and bridges. The Wat Mahathat is one of the most breathtaking ruins in the central zone. It contains a large, seated Buddha figure among pillars of sala. The north zone is home to the impressive Wat Sri Chum. Here you'll find another massive, seated Buddha with famously photographed fingers. Each zone has its own admission fee. Also, keep in mind, there is a small fee for transportation including bicycles. Give the amount of visitors the area is receiving; the old city has seen a lot of restoration since the 1960s. It is meticulously maintained and well furnished. While it all looks very polished, you might be looking for something less restored. If that is the case, just take a stroll down the unmarked tracks to find some of the more untouched ruins. One of the best ways to see the park is by bicycle. You can rent these from a small shop right near the entrance. Walking is also an option, but give yourself 6 hours or so to walk through the northern and central zones. Try to arrive in the morning while it's still a bit cooler. The most exciting way to experience Sukhothai is by seeing it from every angle. Rent a bike and watch the city pass you by. Take a tuk-tuk for a view from the backseat. See the city at sunrise, or rent a motorbike for a fast-paced look at Sukhothai. For a special taste of the local flavors, visit the fresh market in new Sukhothai. Here you will be able to sample specialties like sticky rice with deep fried pork, sweet deep friend beef or some spicy pork salad wrapped in a banana leaf. The Chopper Bar is a great rooftop restaurant with live music, and the Dream Café is one of the most famous spots in Sukhothai. It's an old Thai home with loads of charm and a delicious menu of traditional Thai and western foods. If you're looking for some authentic Thai noodles, head to the Kru Eew. You'll find noodles and pad Thai. If you are looking for a delectable seafood dinner, though, make reservations at Fueng Far. Located on the Yom River, this spot is mainly meant for dinners. The food is known as "fish food" and all locally sourced. Enjoy dishes like the pla krai (fish ball boiled in dipped in a spicy sauce), the tom yom hua bla (tom yum fish head), or the kob phat kra pao (stir fried basil frog). If this is your plan for the evening, plan to take a motorbike or a tuk-tuk, as Fueng Far is located in a very dark part of town. If you missed the market in the morning, there is a Sukhothai night market. You can still find more local varieties of foods. Known to locals as the "To-rung," there are also several food stalls featured along the Rachathani temple fence. To get around Sukhothai there are several songthaews that travel around the region. The purple ones run to and from the bus station while the blue ones take travelers from the bus stop to the historic park. There are also tuk-tuks around the city that will take you to the Old City. Know the fair prices for a trip to the park, and be ready to haggle with the drivers.